This week’s BEACON Researchers at Work blog post is by MSU graduate student Elijah Lowe. “But wait – aren’t you getting your Ph.D. in Computer Science?” That’s a question that I have gotten used to hearing in my matriculation through graduate school. The short answer is yes, I am getting my Ph.D. in Computer Science, but I am also part of the Quantitative Biology program, and part of BEACON Center for the Study of Evolution in Action. With that said, I’m not your traditional computer scientist. During my undergraduate career, I participated in several summer research experiences, one of which introduced me to the field of computational biology. My research project was to identify residues in proteins that are important for structural and functional purposes. The more important residues are usually conserved from one organism to the next. This conservation can be observed by mathematically modeling the protein and identical or similar proteins in other organisms. At that point in time, I had one biology class under my belt, and it wasn’t doing me any good. I started off with no idea of the biological implications of the data. That summer proved to be a pivotal point in my future research career because I developed an interest in the field of biology. As I was developing code to analyze biological data, I found it a bit tedious because I did not completely understand the problem. This lack of understanding fueled my interest in biology. I wanted to better understand the problem so that I could better process and analyze the data. After that summer, I wanted a lab where I could work on computational science, as well as wet lab biological science. Michigan State University turned out to be a great fit. I found an adviser, Dr. C. Titus Brown, with joint appoints in Computer Science and Microbiology and Molecular Genetics. Since joining the Brown lab I have had the opportunity to learn of the growing pains of working in a wet lab, and it is a world of difference. There is no print function to determine if I set my parameters correctly, or to see if a block of my code is being executed. There are controls in biological experiments, but the margin for error is a lot smaller, and I learned this the hard way. However, once the balance shifts from “learning” to actually successfully completing an experiment, the sense of accomplishment makes everything worth it. Although there are long days and occasionally sleepless nights, I wouldn’t trade what I’m doing for anything. I’ve found that job that I would do for free – well, not free; I still have bills to pay. I get to go to “work” everyday and do something I enjoy. Currently I’m working on a cross-disciplinary evolution and development research project where I get to use my computational skills to analyze transcriptome data, and my wet lab skills to answer biological questions. There are two closely related species of Molgula, which are believe to be some of the closest related invertebrates to all vertebrates. The two species—M. oculata, and M. occulta—look very similar in their adult life, they sit on the bottom of the ocean and filter feed using their two siphons. Molgula fall under the phylum Tunicates. During development tunicates have a tadpole like stage that is similar to all vertebrates. The tailed tadpole phase is one of the key features that group tunicates and vertebrates into a group known as chordates. One of the species, M. occulta, has loss one of the key features that make it a chordate, and we want to find out why. 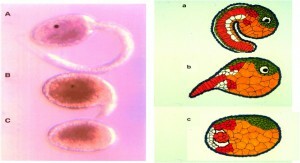 In lab conditions the two species can be cross-fertilized and a hybrid forms with a tail about half the length of the M. oculata. Using the two species and the hybrid, we’re analyzing gene expression levels computationally and experimentally, in hopes of finding the gene regulatory network behind this loss of tail. Another great opportunity that has come out of this project is the ability to travel and collaborate with other labs. I spend my winters in Michigan, which is great, seeing how much I love snow, and freezing cold weather, and I spend my summers in Washington or France. I have the privilege of working with Dr. Billie Swalla during the summer months, which has been a tremendous asset. I have learned a lot working under Dr. Swalla. The training I received in the Swalla lab was important to my development as a scientist, seeing that I come from a computer science background and wasn’t formally trained as a wet lab experimental scientist. The way research is conducted has evolved. There is a strong push for collaboration and interdisciplinary research. I feel that I am being well prepared for this shift, and much of my preparation can be attributed to BEACON in some shape or form. The experiences that I’ve had are not ones that an intercity kid from a public school typically gets, but because of my desire to uncover the unknown, I’m living a life I never dreamt of. 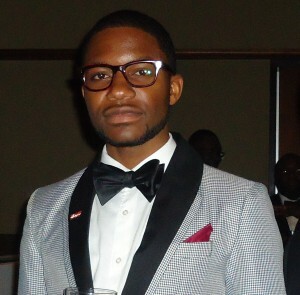 For more information about Elijah’s work, you can contact him at loweelij at msu dot edu. This entry was posted in BEACON Researchers at Work and tagged BEACON Researchers at Work, Biological Evolution, Computer Science, Field Biology, tunicates. Bookmark the permalink.